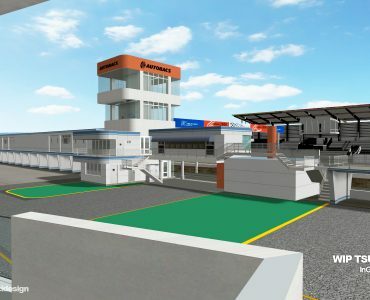 After a little hiatus, Mario Morais continues to make great progress with his Laguna Seca project for rFactor 2. Below are two new previews, showing the recent progress made on the terrain textures. This could be really good one day. Its got some work to do yet though. Such an exciting project. Can’t wait to see more! 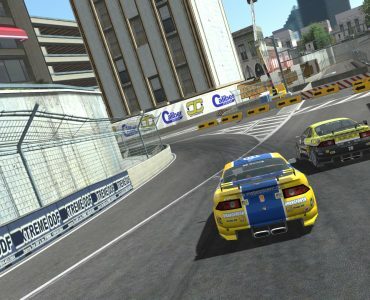 What happened to the Laguna track that was posted 2 years ago on the forum? This the same mod? Promising. 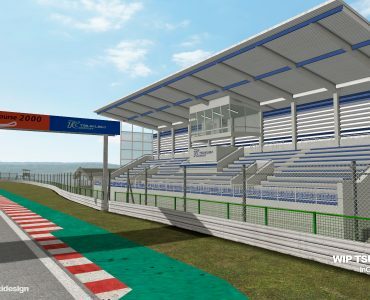 Looking forward to this, as rF2 needs more high quality circuits. Really!! Only reason I don’t go near online. Silverstone and Indy GP are the only decent tracks worth racing IMO. Can’t really think of any good modded tracks besides bahrain that doesn’t look like a 80s cartoon. There is one track that was impressive but its frictional so won’t even bother downloading. The one with the ship docking, sorry can’t think of the name. There are quality tracks around. Croft, Poznan, Mid-Ohio, Symmonds Plains and McNolo’s CTDP Bahrain conversion are all quality. There’s also a few re-done circuits at RaceDepartment are quite nice. That said, there still needs to be more. Can’t believe I forgot about Croft and Poznan. I must redownload them later. Will check out those other tracks, thanks! I’m having bags of fun racing Dubai, Poznan, Longford, Lester, Oschershleben, Mid Ohio, Bahrain, Mores, Birmingham, Croft, Sao Paolo, Sachsenring, Assen, Road America, Silverstone, Indy, Lime Rock Rock, Laguna, Autodrome Most, Daytona RC, Snetterton, Thruxton blah blah blah etc. The list goes on and on. Plenty of beautiful and technically very advanced tracks to choose from, from all eras. The tracks have such life to them, the trackside objects, the marshalls standing around, changing light, clouds rolling in, shadows coming and going. Such immersion. Immersion being an often overlooked feature of rf2. There is a similar scenario in the WW1 flight sim genre. Rise of flight looks pretty and is a very good combat sim. Wings Over Flanders Field however is based on an old Microsoft Combat Flight sim engine and immersion wise blows the doors off Rise of Flight for the sense of actually being there. There are plenty of those immersion vs shiny graphics arguments going on over in the flight sim community as well. Sorry but most of them to me look like rf1 quality. If this is high quality i really don’t know to see the mid to low stuff. I don’t base my opinion of a game or its graphics by low quality you tube videos. We know rf2’s graphics aren’t quite as nice and shiny as AC and pcars but to say the only 2 tracks worth racing are Silverstone and Indy gp is ridiculous. They don’t look anything like a cartoon. Lol! What, are you BLIND? rF2… 80’s cartoon. Same thing. My friend MArio..one of the greatest track builders…all the best! Sorry to rain on the parade but I doubt this will ever see the light of day. And you’re basing that on what, exactly? Anyway, now modders turn back to isi and they must make their own content. And their content is great! Really is! However, complex tire model make it hard to modders so alll mods look bad as modders use isi tires instead creating real tire that particular car have. So , unless modders start to buy real tires all over the place and start to testing them, i just can see any good mod comes out. Yes, we will have endurance and cart factor, but it’s just conversion. You can convince yourself that is great, but actually is not. AC was much smarter, tire model is easy to use and some modders content already become part of retail game as main content physics is average. So, lets hope for that isi will make few nice cars and tracks and let’s open crowdfunding for buying tires for modders. I pretty much agree with al that you said, except the last part….this track will definitely be made, what it’s not certain is that will be in ISI RF2 content. ISI makes money by providing the most complete and accurate vehicle dynamics platforms on the market. Modders are free to charge for their work in whatever way they please. Many sim developers started as modders on their engines and wouldn’t exist without ISI. grid when various advancements and a further opened architecture led to rFactor Pro. “ISI makes money by providing the most complete, state of the art, most accurate vehicle dynamics platforms on the market. AC may have made things easier for modders. But come on… is easier always better? I can very distinctly feel a big difference in the tire physics between those two sims, and AC just doesn’t come out ahead in my opinion. When modders do get it right in rF2, the result is astonishing. Quality over quantity, that’s how I see it. rF2 modding is picking up at a fast rate these days, and don’t fool yourself: the talented modders are able to make conversions feel like totally new cars, when the new tires, chassis flex etc. is implemented. I don’t “convince” myself of anything, I just sit down, race the content, and feel a vast difference to the better. That’s that. You’re allowed to see things your way. But I really can’t agree with you. Things are looking bright. What does your opinion know about tyre model physics? All I see is you worshiping rF2, and saying AC is all made wrong. Please show me a quote I’ve made, where I state that “AC is made all wrong”. Thank you. Lol, 99% of AC mods are bad conversions or ribbed from rF! and those mad from the scratch have a very bad physics and far below the original Konus standard! Well….no….sure most are bad conversions, but the scratch made ones usually have good physics….some are even as accurate (if not more) as some of Kunos’s cars. maybe for tracks some modders opted to give the community more tracks faster that way… but idk if people still use those tracks conversions nowadays. I see now being more popular scratch made tracks, and the already available in the game. About cars, majority is really scratch made for AC. I think only URD cars were previously made for rf2, then adapted to AC. But rest are made on purpose just for Assetto. You’re absolutely right! As a modder, ISI knew all along that I would be very interested and motivated to work with an engine so open and so dynamic. I feel exploited, spending countless hours enjoying working on my mods and driving them in rFactor. Shame on ISI! You forget one little fact: ISI is developing a complete platform for those mods, wich is not an easy task considering the complexity of this software. So without that platform, modders work is useless. If we are in the position do demand anything, I think we should demand a bit of respect for what that software developer has achieved for this whole genre and our hobby. That platform gave some of those modders the opportunity to show their skills and get attention from developers. And you are right: Kunos went the smarter way, making things more accessible and easier to plugin, though you still need the skills in 3dsmax/Blender or PS. But the question is: do we want to see this genre go forward or do we want to run in circles, just taking advantage of better and more optimzed graphics engine, when at the other side of the medal the rest falls pretty short. I don’t say, that rF2 is perfect. But just taking a look at what it is and what it offers, I got to say that it is the best and most advanced sand box experience when it comes to racing sims. You don’t find that many different cars with a huge viarity and technical features in any other sim. There is so much content available that I simply don’t have the time to master it all, may it be different cars combined with different tracks. But people just want moar, even if there is enough. On a final note: modders/3rd party content has also been implemented into rF2. Three tracks afaik, the NSX and the Corvette streetcars. So that argument fails. Tigermoth started as a modders track aswell. Been waiting for this mod for a long time. I dont like the pcar version, and still prefer the gt6 version and iracing version, i hope this will be as accurate or good as those two. What is LiDar? Is that a type of laser scan? or something completely different? ISI has done a fantastic work in all these years, that can’t be denied!…it also gave us some of the best sim hours in our life, and RF2 has everything to be a trully great, but the final package IMO still doesn’t deliver…i’m sorry to say this, because i always loved ISI, but RF2 lacks specially in content, wich is one of the most important things, it failed to deliver good tools and info, so modders could do a decent work, and that for a company that gain so much with 3rd party works, it’s a monumental flaw, and with less importance, in graphics…yes, it’s not the most important thing, but by imersion, i also consider the graphical aspect, and although improved, it still it’s lacking A LOT…so regarding this subject, i’m always glad to see potential good content being made…i just wished that after so may years, one wouldn’t count by the finger of one hand the quantity of must have tracks and cars present in the game…but each one, each ideas…although lacking a bit in some features, and with margin to improve it’s tires/terrain aspect (although in terms of suspension is imo superior to RF2), right now i prefer good moments of nirvana playing offline/hotlaps with AC…if everyone had the talent of Mario, i’m sure the final result in this “competition” would be much more in favor of RF2. One sentence stands out… “final package”. 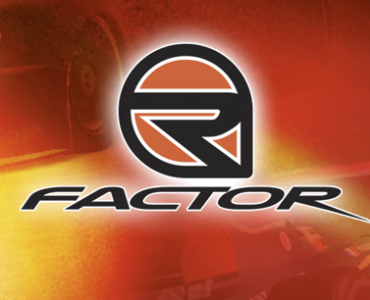 rF2 has the most accurate vehicle dynamics and support more suspension types than the competition. And rFactor2’s graphics are great where it matters, from the driver’s POV. Do you have a source of that? Would be nice to check it out. Sorry, what does this have to do with Laguna Seca LIDAR for rf2? Keep up the good work Mario!